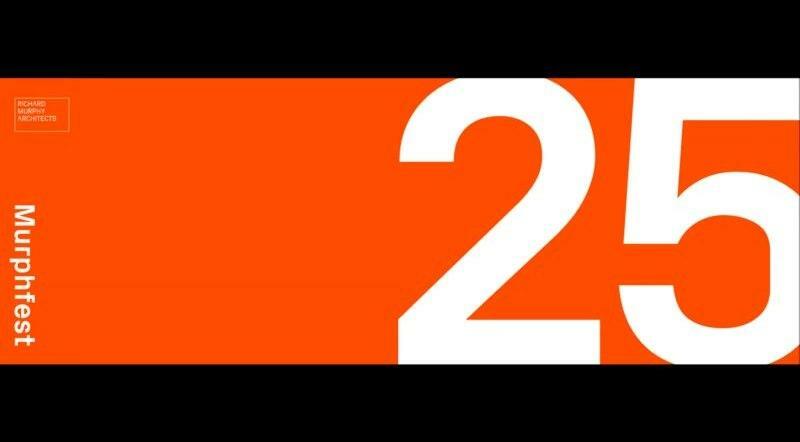 RICHARD MURPHY ARCHITECTS ARE 25 YEARS OLD! “MURPHFEST” held on the weekend of 1st and 2nd of October marked exactly our quarter century. 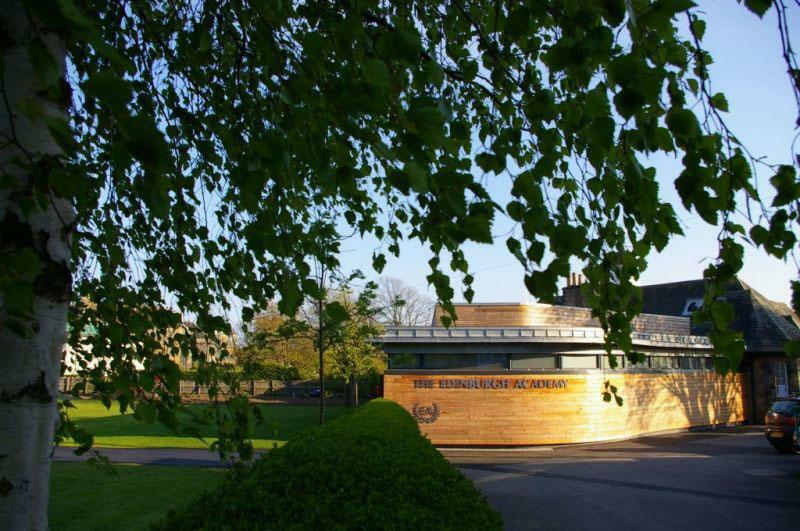 Richard opened his own house on the Sunday and had a steady stream of visitors, there was of course a party on the Saturday night, but the highlight was undoubtedly a conference in the National Museum of Scotland auditorium on the Saturday afternoon. 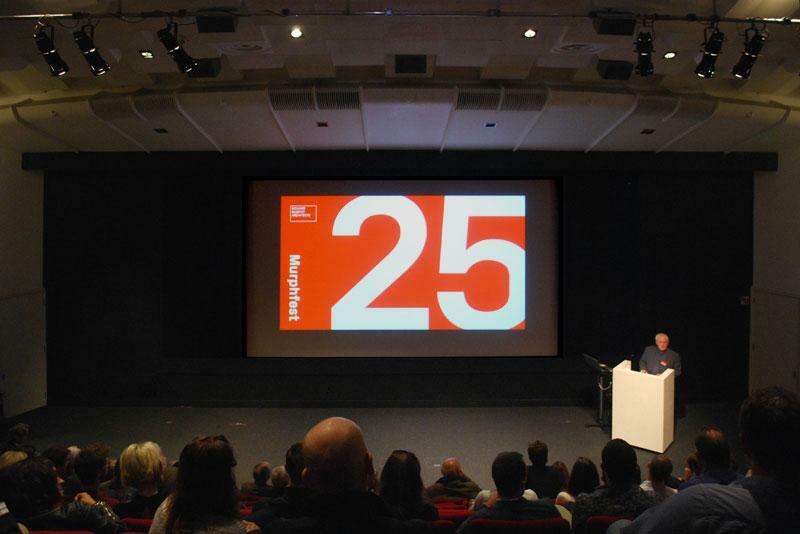 This saw John Sergeant, Richard Weston and Ted Cullinan lecture on some of their, and our, favourite buildings and it was preceded by a musical slide show: “Murphfest 25.” You can see our 25 years flash past in 15 minutes by clicking the image below to download the movie. After the Saturday conference a client of many years ago wrote to us and we are delighted that she has agreed for us to share with everyone her thoughts on what she saw. You can read her email here. We were delighted that our proposals to convert and extend this very important Greek revival building for St Mary's Music School were unanimously approved by the Planning Committee in August. 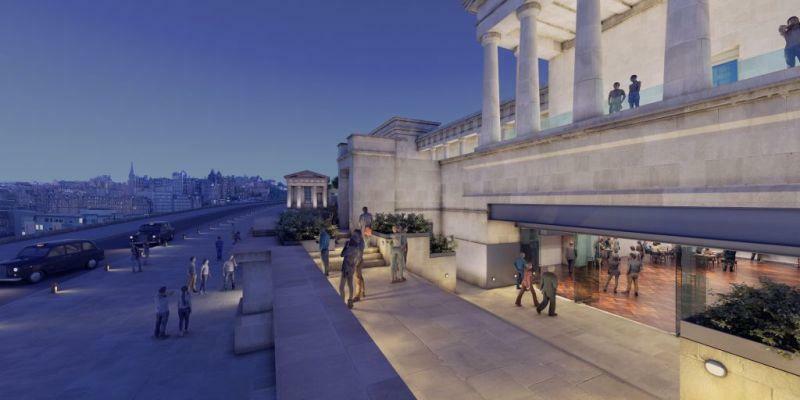 The chairman of the Royal High School Trust, Willie Gray Muir said “this is a wonderful opportunity to transform a building at risk into a dynamic asset for students, residents, visitors to the city, educational and cultural organisations and the creative sector as a whole”. The building’s fate now lies in the protracted and so far unsuccessful attempts to convert the building into a hotel. 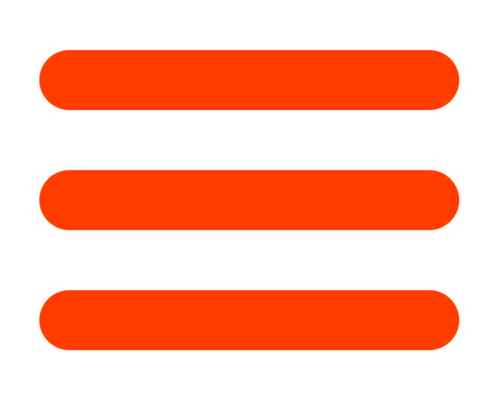 If they continue to falter we are on standby to progress our project. 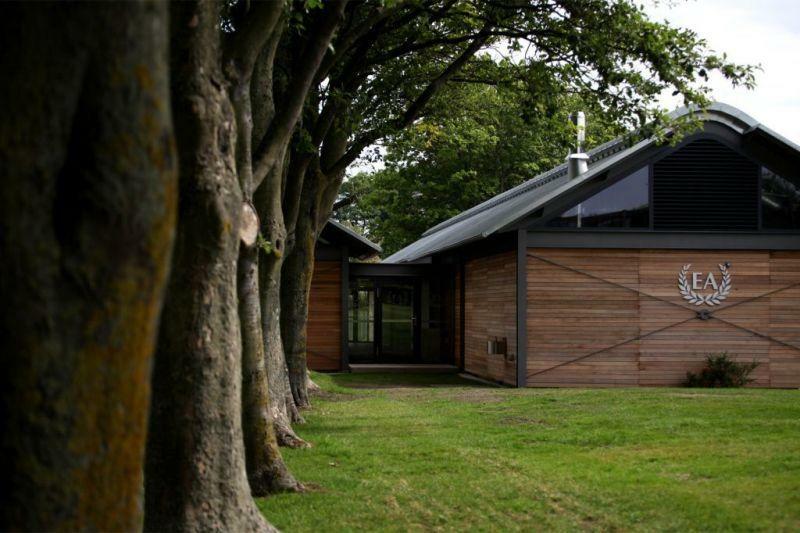 In August the Academy hosted a Saturday of festivities to mark the official completion of our two projects for them, a hockey changing pavilion and a greatly expanded existing pavilion which will be used for rugby. Five hundred students, staff, parents and ex-students turned out to watch games, hear speeches, eat hamburgers, tour the buildings and generally enjoy themselves in the sunshine. 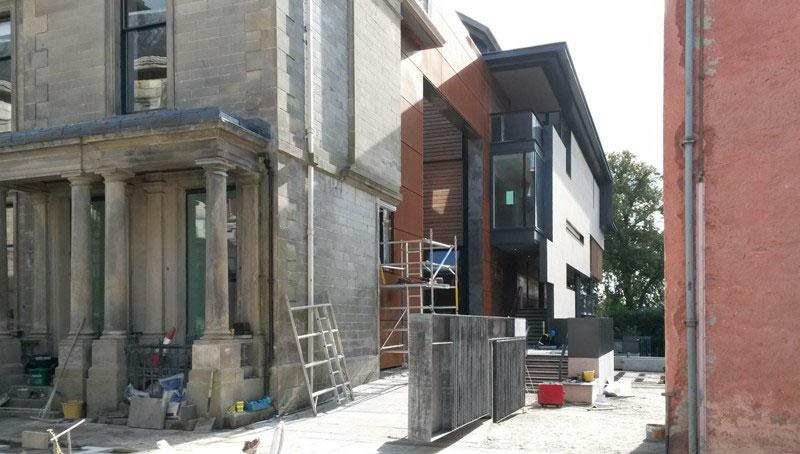 This exciting competition winning project is about to be handed over to Fife Council when the fit-out of the Museum will commence and the staff will start moving in. We understand that the building is provisionally scheduled to be open to the public in May 2017. The pictures show the elevation to the Abbey graveyard, the “street” down the centre of the plan and the corner panoramic “lookout” window in the museum. 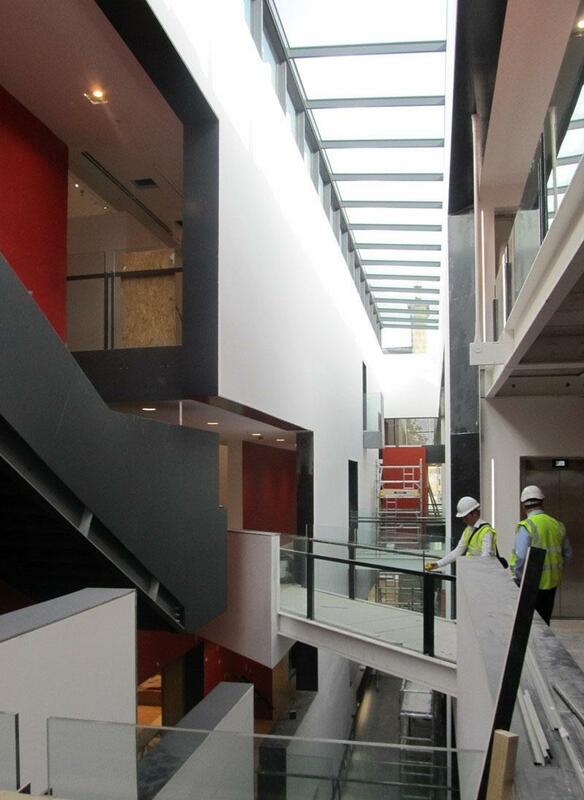 Our project for the University, designed in association with Taylor Architects, is due to be handed over this month. It consists of a 125 seat auditorium, rehearsal spaces, seminar rooms and substantial foyer etc all housed within historic warehouse buildings at the heart of the campus and it will be called the “O’Donoghue Centre for Drama, Theatre and Performance” or, if you prefer, “Ionad Drámaíochta, Amharclannaíochta agus Taibhléirithe Uí Dhonnchú”. 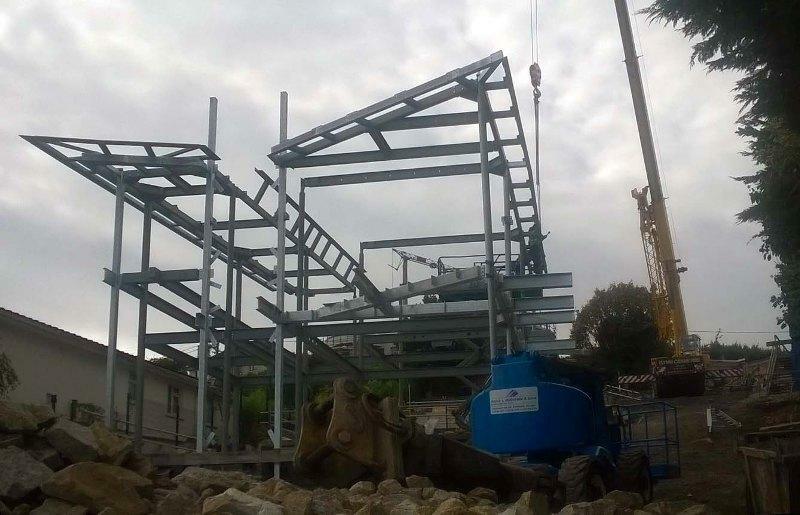 Our colleagues RPP in Belfast have taken our design onto site. The hospital was won in competition and consists of 80 beds arranged into courtyard wards arranged around a walled garden. The contractor is Graham / Bam Joint Venture and the completion date is expected to be in August 2018. Restoration of the historic auditorium proceeds simultaneously with the new build foyer and studio theatre etc. The right hand picture shows the auditorium upper circle, not used for many years being rebuilt to be brought back to life. 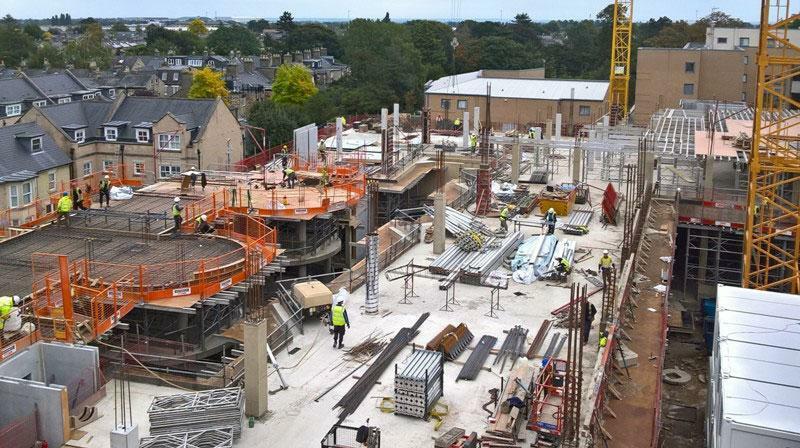 The left hand picture is the first floor slab cast outside. The view is actually the location of the bar! 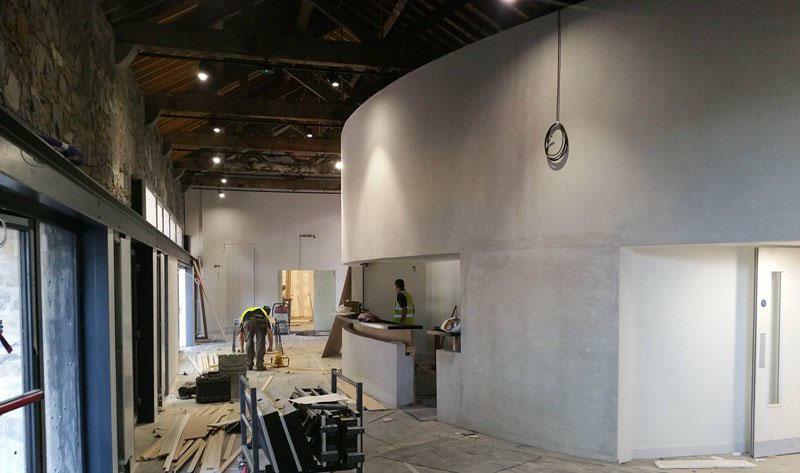 The exciting moment has arrived and the shape of the house in Dalkey, near Dublin, can now be seen to be taking shape. Photograph courtesy of M&P Construction Limited. Our project for a new Science Faculty building for Anglia Ruskin University in Cambridge has reached the penultimate floor. In the photograph the atrium and the two internal round towers of psychology testing rooms can be seen. 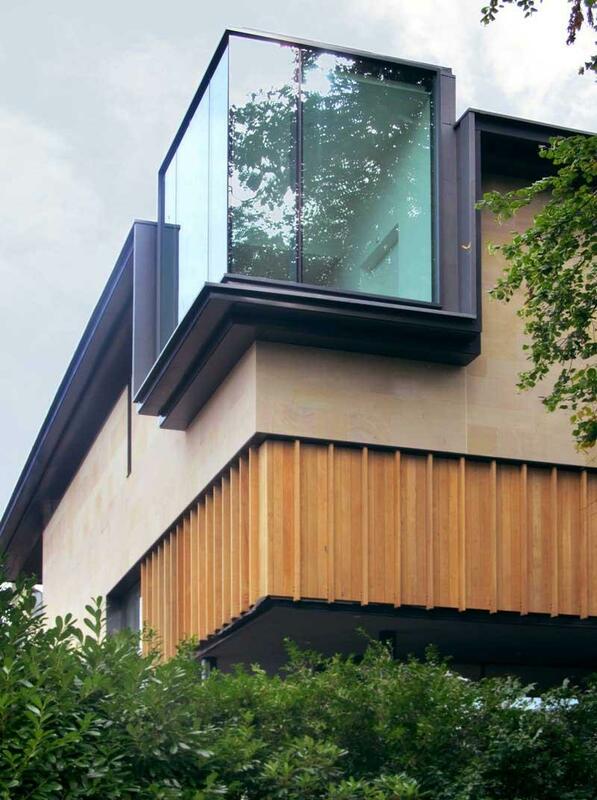 Richard’s own house at Hart Street is one of the houses in the RIBA / Channel 4 Grand Designs “House of the Year” Competition. We believe that the four week series is provisionally scheduled to start on Wednesday 16th November with Hart Street featuring in the next programme, on the 23rd. If it's shortlisted it will appear again on the 7th December. The planning committee decision on 18th August for the Royal High School attracted enormous publicity. 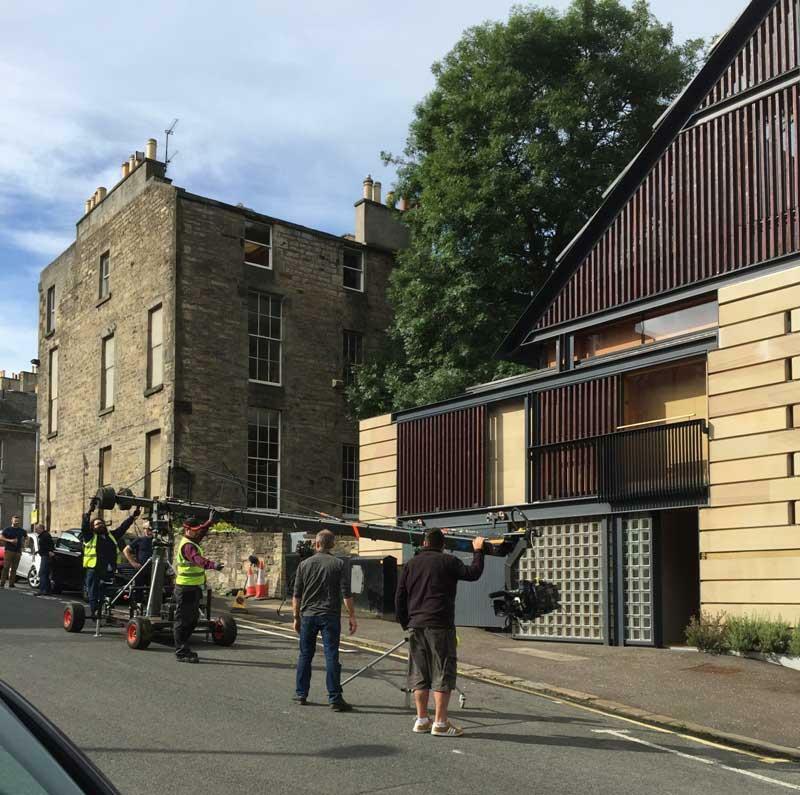 Articles appeared in BBC and STV news reports, The Times, Edinburgh Evening News and with the AJ online quoted the report by planners which described “.... Murphy’s proposals as ‘sensitively designed’ and a ‘measured reuse’. “ The Councillors stating that they “....welcome not only the proposed restoration and repairs to the listed building(s) on the site, but also the design of the new school accommodation blocks that, by their scale and positioning, firmly retain the primacy of the Hamilton building on the site.” . The report added that the plans ‘would make a potentially valuable contribution to the city’s cultural infrastructure’. Richard has been talking to the Cockburn Association about the Royal High School project and to the London chapter of the Institute of Historic Building Conservation during their conference on Character Building: Putting Heritage at the Heart of Planning and Placemaking, he lectured on our recently completed development of the Young Street site in Cambridge for Anglia Ruskin University. Richard also appeared in the BBC programme “New Town”. Richard is due to speak at the Surgeons/Physicians Dining Club at Surgeon’s Hall in Edinburgh on 14th October; at a Conference on conservation and heritage in the Aberdeenshire area at Haddo House on 27th October; and at Dundee School of Architecture on 10th November about the practice's projects in the context of “Value & The Void” – how do we use 'void' and 'mass' to provide clarity and organisation to a project. Richard has been elected to the RIBA Council for three years. He topped the poll with over 700 votes. His interest is procurement and he has been elected to the Council’s professional practice & profession committee. 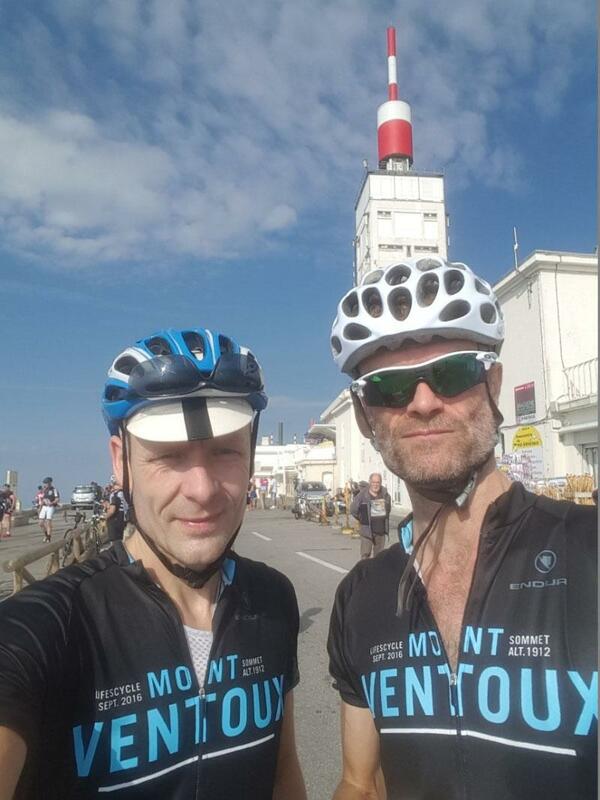 Directors, Bill Black and James Mason, successfully completed all three routes up Mont Ventoux in Provence in a single day’s cycling. 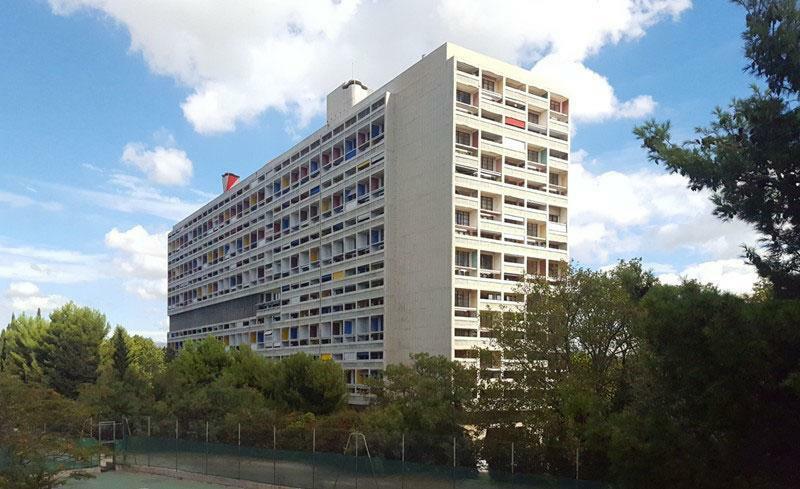 While there they took a detour to Marseille to pay homage to Le Corbusier’s Unite D ’Habitation building that’s currently undergoing extensive renovation to ensure it can be enjoyed by future generation of residents and architectural pilgrims alike.